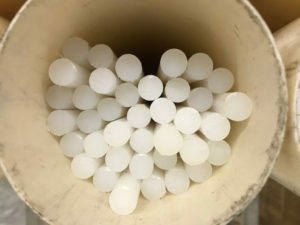 New record by Omniplastic for the production of small round rods. Forever a leader in plastics extrusion and processing, the company’s specific focus on the manufacture of plastic rods has led to a 30% increase in production volumes within the sector. This outstanding result was made possible also thanks to the introduction of new machinery, specifically designed to improve the quality and shorten the processing times of specific plastics, the result of an extensive study conducted by the company’s inhouse research and development team. The rods, in white or black extruded plastic, can be produced with a diameter ranging from 6 to 20 mm and are suited to all applications, although most typically used in the mechanical and precision mechanics sectors. Our bars in POM, PA and PET are ready for processing even with automated numerical control lathes. Thanks to this latest boost, Omniaplastic has confirmed its standing as a leading company in the plastic stock shapes sector, offering numerous benefits to clients such as product quality, fast production and the possibility to manage large production volumes in a very short time.